Welcome to the family, little guy. I think you’ll like it here. I finally picked up my latest addition to the ever growing collection of small single cylinder vehicles today! I was browsing craigslist for a more traditional mini bike with a single speed motor like a predator 212 so I could add a sidecar to the frame and make a beer cooler pit bike, then this came up. 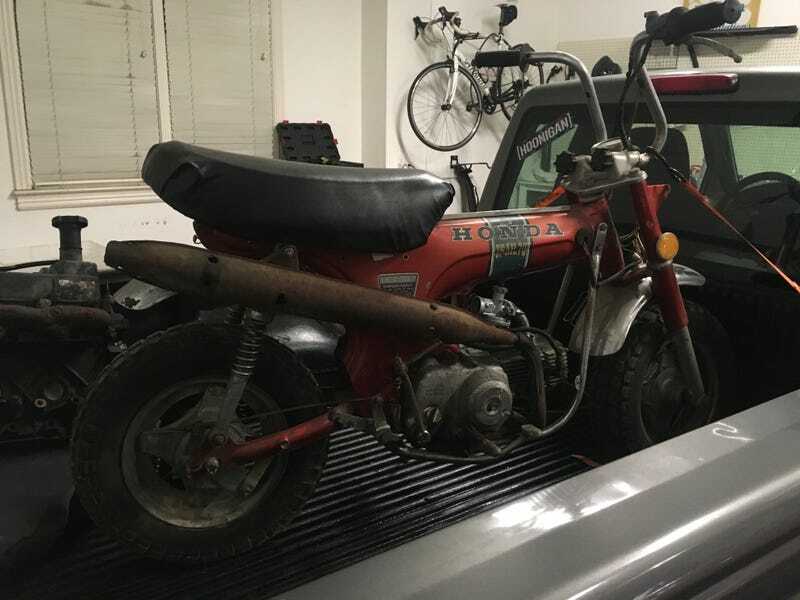 It’s a 1972 Honda trail 70 that “just needed a carb” and the seller wanted a mere 300 dollars for it. I don’t think I’ve ever hit “reply” faster than I did when I saw it. I messaged the seller on Friday before I went out of town to see my girlfriend graduate college, and he agreed to hold it for me until I got back today. I spent most of the weekend on various websites researching about restoring and upgrading trail 70’s, and the best course of action for this one. Even though I had been in the car all day (drove from Gainesville, FL to Nashville, TN today in my girlfriends ‘98 Camry with 91000 original miles, seriously!) I jumped in my truck and made the hour or so trek out into the sticks to pick this thing up from Darrell and his other brother Daryl, and Darrell couldn’t have been nicer! Turns out hes a bit of a Honda monkey bike freak, with z50’s, ct70’s and even atc70’s all over his shop along with the “7 or 8” parts Ct’s he had in a trailer out back. I loaded it up in my truck and dragged it home! Turns out the paint and petina is in great shape, it just needed a wipe down with some simple green on a rag. On Friday When I knew I wasn’t getting it I ordered a new carb from amazon prime which I have installed now. I haven’t gotten it started yet, as I still have to fix some throttle cable adjustment issues, but I don’t need see why it won’t once I get it all dialed in. My eventual plan is to take the approach Jon ward does on the derelicts at Icon. vintage vehicles in a modern context, but they keep their petina. I plan on a 140cc piranha motor, some more modern pit bike style inverted forks, and disk brakes front and rear. All of that is gonna happen because these aren’t just a normal mini bike. They’re a mini bike with a headlight, a tail light, and most importantly, a vin number. They can totally be titled and tagged! I’m hopefully going for a modern feeling, modern performing Honda grom, stuck in a vintage trail 70 body. This should be a fun one.